Home Blog Are You Getting Enough Fats in Your Diet? Are You Getting Enough Fats in Your Diet? Fat is satiating, leaving you with a full feeling and regulating your appetite. Some fats are more satisfying than others, namely polysaturated and saturated fats like oily fish, walnuts or butter. The monounsaturated kind, such as avocado and peanut butter, tend to be less filling. 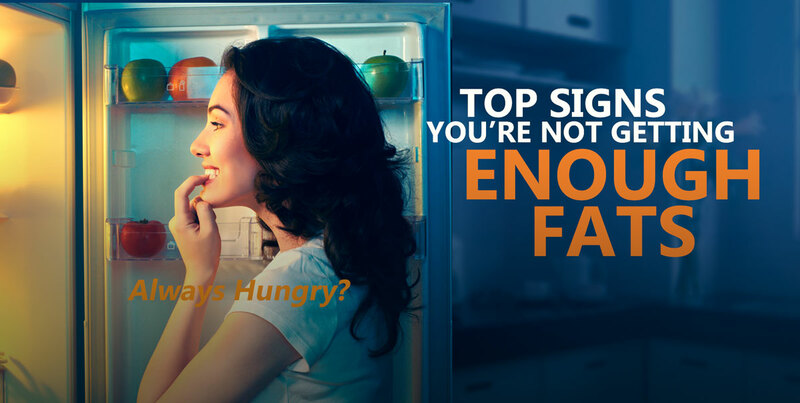 So if you’re feeling hungry even after eating, you may not be getting enough fat. How about that 3 PM slump? No energy by the afternoon? If you’re having healthy lunches without enough fat content, you won’t have energy for that second part of the day. A salad without dressing can be the culprit. A quinoa-chickpea Buddha bowl without avocado can be the problem. Make sure you’re implementing quality fat sources in every meal. When you eat healthy fats with carbs, the fat will slow down the digestion of those carbohydrates and improve your insulin sensitivity. That will help you fight that sugar crash you may feel after a heavy meal. Feeling depressed? How about mad? Do you experience constant mood swings? There’s plenty of information on the effects of fat on mental health. In fact, the American Journal of Psychiatry suggests omega-3 fatty acids may help mild mood disorders. You can find the entire AJP research here. Besides increasing omega-3s, you can also decrease omega-6 fatty acids in the diet, which may improve the efficacy of the omega-3s. It’s really all about the ratio, since most people get too many omega-6s, especially in plant form. Especially around your hands and feet? Fat helps regulate your body’s temperature, insulating your body. Fat also protects your inner core from extreme temperature drops, so if you’re cold even in warmer weather it may be worth trying to eat more fat and seeing how you feel. You’re doing all the right things, but can’t lose weight? If there’s very little fat in your diet, you’re probably having more carbs or more protein. For more weight loss success, eat more fat, which will decrease your carbohydrates and your body will access fat stores for energy. Think ketogenic dieting, where your body is induced into ketosis and starts to use fat as energy. If you’re interested in keto dieting, you can get extra support with the first ever ketogenic pre-workout powder Best Pre Workout™ to help you with energy and mental clarity to fight off the low-carb lethargy.